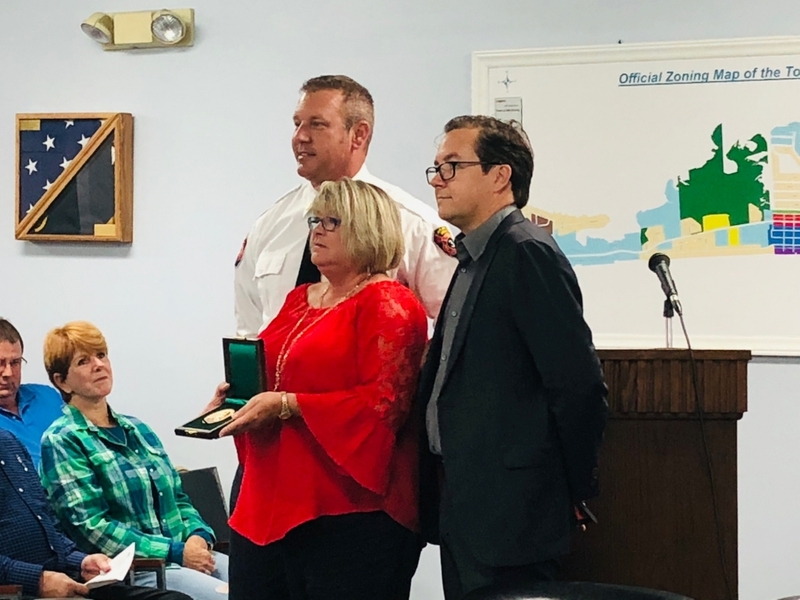 After an Oct. 22 medal presentation, from left, Atlantic Beach (N.C.) Fire Chief Adam Snyder; Paula Jordan, sister of the late Carnegie Hero Scott Derrick Whitford; and Atlantic Beach Mayor Trace Cooper pose for photos. Cooper and Snyder presented the medal to Jordan on behalf of her brother, who died trying to save a 15-year-old girl caught in a rip current on June 17, 2017. Whitford, 56, of New Bern, N.C., entered the Atlantic Ocean, and despite rough conditions, swam to the girl and grasped her. She clung to him, and he submerged several times. Ultimately they separated, and emergency responders brought the girl to safety. Whitford had drowned. The medal was presented to Jordan at an Atlantic Beach Town Council meeting.